We use our phones for most things these days—scheduling meetings, throwing birds at pigs, keeping track of everything from our grocery lists to our periods, checking Facebook, calling our mothers. So is there a limit to how far we're willing to let these little devices into our lives? As much as you love your phone, would you want it to tell it your secrets and let it be your therapist? 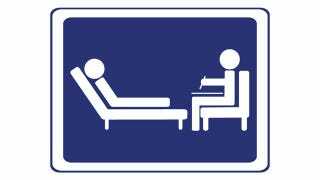 A therapist phone sounds a little far-fetched, but it's already a reality. Scientists at the new Center for Behavioral Intervention Technologies at Northwestern University are working to develop technologies that can be used to treat depression, among other things. They've got many interesting-sounding projects in the works, including a "virtual human therapist" who teaches teens social skills to prevent depression; a medicine bottle that tracks your antidepressants; and a social network that connects cancer survivors. But perhaps their most compelling innovation at the moment is a smart phone that's like a little pocket therapist, monitoring your activities and coaching you to take steps to make yourself feel better. The complex little apparatus tracks your location, uses an accelerometer to monitor your activity level, and also gauges your "social context and mood." That is done, at least partially, by establishing your usual pattern of making calls and sending emails. Then, if you begin to deviate from your normal behavior, the phone senses that you're isolating yourself—a major symptom of depression—and prompts you to call a friend. Whoa. Readers of Gary Shteyngart's Super Sad True Love Story can now commence looking for helicopters overhead. Makes sense. Though there's a certain point with depression where you become incapable of doing things like reaching out to friends, no matter how much you'd like to. And it seems like the last thing you'd want at that moment is some Siri-like creature chirpily reminding you that it'd really be great to call someone for brunch. Maybe that's when it's time to call in that fancy medicine bottle that gives you your daily dose of antidepressants. The magic pill genie alerts you if you miss a dose and works in conjunction with an app that tracks symptoms and side effects. It can even tell your doctor about possible changes that need to be made to your regimen. Wow, that's neat, useful, and yet also extremely terrifying. These new approaches could offer fundamentally new treatment options to people who are unable to access traditional services or who are uncomfortable with standard psychotherapy. They also can be offered at significantly lower costs, which makes them more viable in an era of limited resources. That all sounds great and very worthy. But it's hard to imagine these innovations wouldn't quickly go into widespread use among the general population. After all, we are constantly trying to improve ourselves and make things more convenient. We want our electric toothbrushes to do the work for us, why wouldn't we want our pill bottles to as well? Our phones are already practically part of our bodies; so why shouldn't they keep track of our every mood fluctuation while they're at it? Well, there's this old-fashioned concept called privacy, which you may have heard of. Sure, it's fine to share your personal information with yourself, which is basically how we think of our phones at this point, and it's also usually safe to let your doctor in on your feelings. But imagine if every detail of your mental health history, your phone calls, all of your movements, and your prescriptions were accessible to any old person—like say an employee of the phone company or your ex-husband with whom you are fighting a nasty custody battle. Then it's not so cool. Of course, none of these concerns are exactly new. Much of this sensitive information is already in your average phone and can be pretty easily accessed by anyone with an interest, and your medical records are on a computer somewhere too. But it gets extra dangerous when you connect everything and pile it into one not very secure place. If you thought your Zappo's account getting hacked was bad, just wait until someone hacks directly into your mind. Alright, fine, we're not at that point quite yet. But in all seriousness, the possibilities for how this kind of information could compromise you or be used against you are endless and quite panic-inducing. So perhaps before we rush to start sharing our innermost thoughts and private behaviors with our phones, we should first decide whether these are things we'd be willing to tell a random employee of the Genius Bar or someone from your company's HR department or a judge. Because as friendly and helpful as a therapy phone might seem, it's a Big Brother device if there ever was one.